New Cross and Hatcham went through enormous changes in the 19th century. With the continued expansion of the dockyards and factories in nearby Deptford, more housing and schools were needed. New Cross before that time consisted mostly of privately owned farms and common land. 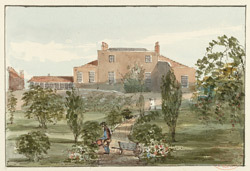 Mr Bently's school near Telegraph Hill was one of the first to be set up by local trade guilds. This process gathered pace in 1868, when the Haberdashers' Company bought Hatcham house in 1868 and began developing the old mansion on the south side of the New Cross Road. In the 1870s, the company set up two more schools in the area of Telegraph Hill. Their pupils were mostly the sons and daughters of factory workers.